ABC’s returning dramas Ugly Betty, Grey’s Anatomy (the nights most-watched program among adults 18-49) and Lost (now in its new post-Grey’s Anatomy timeslot) led ABC to a ratings victory last night among adults 18-49. CBS however, was still stronger among total viewers, thanks to the nights most-watched program CSI. The head-to-head battle of CSI and Grey’s Anatomy remains competitive, but both shows drew lower-than average numbers. CSI was off the most (3.35 million/17% among viewers and 22% among adults 18-49), while Grey’s Anatomy was off by 1.66 million/9% among viewers and 11% among adults 18-49 from its last newly aired episode. Curious as to how the two shows have done against each other? Check out the following two CSI vs. Grey’s Anatomy charts–VIEWERS ||| ADULTS 18-49. Lost debuted in its new 10:00 p.m. time slot to solid results. Retention from its lead-in was a very impressive 87% among adults 18-49, and it grew in each category from its last newly aired episode: Households by 9%, Viewers by 870,000/8% and A18-49 by 20%. Everything else seemed to be down on the evening, including the NBC’s comedies. The Office suffered steep declines of 2.3 million/23% among viewers and 22% among adults 18-49. CBS finished in first place for the evening with a 9.2/15 household rating/share and 14.41 million viewers, but was second among adults 18-49 with a 4.0/11 rating/share. 8:00 p.m.: Survivor: Micronesia (7.9/13 HH rating/share, 12.98M viewers, 4.2/13 A18-49 rating/share). 9:00 p.m.: CSI: Crime Scene Investigation (10.5/16 HH rating/share, 16.74M viewers, 4.6/11 A18-49 rating/share). 10:00 p.m.: Without A Trace (9.2/15 HH rating/share, 13.50M viewers, 3.3/9 A18-49 rating/share). ABC followed in second place for the evening with a 8.1/13 household rating/share and 12.33 million viewers, but managed a strong first place finish among adults 18-49 with a 4.8/13 rating/share among adults 18-49. 8:00 p.m.: Ugly Betty (6.0/10 HH rating/share, 8.52M viewers, 2.5/8 A18-49 rating/share). 9:00 p.m.: Grey’s Anatomy (10.7/16 HH rating/share, 16.02M viewers, 6.3/16 A18-49 rating/share). 10:00 (10:02) p.m.: Lost (7.6/13 HH rating/share, 12.33M viewers, 5.5/14 A18-49 rating/share). FOX finished in third place for the evening with a 5.3/8 household rating/share and 8.64 million viewers, but was fourth among adults 18-49 with a 2.3/6 rating/share. 8:00 p.m.: A two-hour edition of Are You Smarter Than A 5th Grader? (5.3/8 HH rating/share, 8.64M viewers, 2.3/6 A18-49 rating/share). NBC followed in fourth place for the evening with a 4.3/7 household rating/share and 6.53 million viewers, but managed a third place finish among adults 18-49 with a 2.9/8 rating/share. 8:00 & 8:30 p.m.: My Name Is Earl (4.0/7 HH rating/share, 6.06M viewers, 2.3/7 A18-49 rating/share) was followed by the time period debut of Scrubs (3.5/6 HH rating/share, 5.30M viewers, 2.4/7 A18-49 rating/share). 9:00 & 9:30 p.m.: The Office (4.6/7 HH rating/share, 7.56M viewers, 3.9/10 A18-49 rating/share) was followed by the time period debut of 30 Rock (3.5/5 HH rating/share, 5.54M viewers, 2.8/7 A18-49 rating/share). 10:00 (10:01) p.m.: E.R. (5.1/8 HH rating/share, 7.35M viewers, 2.9/8 A18-49 rating/share). The CW finished in fifth place for the evening with a 1.8/3 household rating/share, 2.91 million viewers and a 1.2/3 rating/share among adults 18-49. 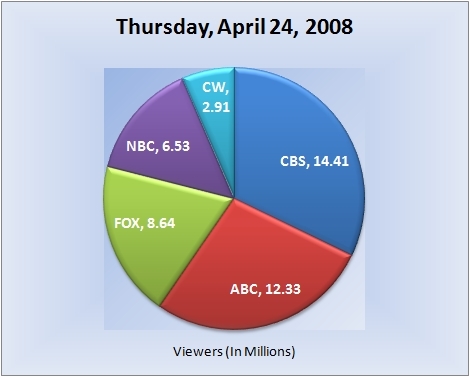 8:00 p.m.: Smallville (2.1/4 HH rating/share, 3.56M viewers, 1.4/4 A18-49 rating/share). 9:00 p.m.: Supernatural (1.5/2 HH rating/share, 2.27M viewers, 1.0/2 A18-49 rating/share). Note: Network average numbers from the week prior are based on fast national data. Comparison’s from the week prior (or episode-to-episode, etc.) on specific shows are based on final national data. Ratings for the current day are based on fast nationals. (Expect all three scenarios to be the case at all times, unless otherwise noted). The final rating for first-run episodes that aired this evening will be reported the following week. So for example, the final rating for tonights episode of “CSI: Crime Scene Investigation” will be reported in next weeks report for Thursday, May 1, 2008.